A 2010 national youth drug abuse study revealed some disturbing results. In 2009, the drugs of choice for 6 of 10 drug abusers in the 12th grade were prescription pharmaceuticals. Likewise, data from a 2008 SAMSHA report revealed that the previous decade had seen a four-fold increase in the number of those seeking treatment for addiction to prescription painkillers. In response to the serious public health problem in this country, efforts are underway to combat this growing threat. One solution is the advent of Prescription Drug Monitoring Programs (PDMP). PDMP is a healthcare tool with a variety of applications. The first PDMP appeared in California in 1939, primarily as a benefit for law enforcement tracking illegal drug behaviors. Today’s PDMP has evolved; as an online database of prescribing and dispensing data, PDMP helps identify when a patient obtains multiple prescriptions from different practitioners. Each database is state-run and used to address prescription drug diversion and abuse. PDMPs serve multiple functions. A PDMP is a patient care tool, a drug epidemic early warning system, and a drug diversion and insurance fraud investigation mechanism. The goal of the PDMP is to reduce the impact of prescription drug abuse and diversion. 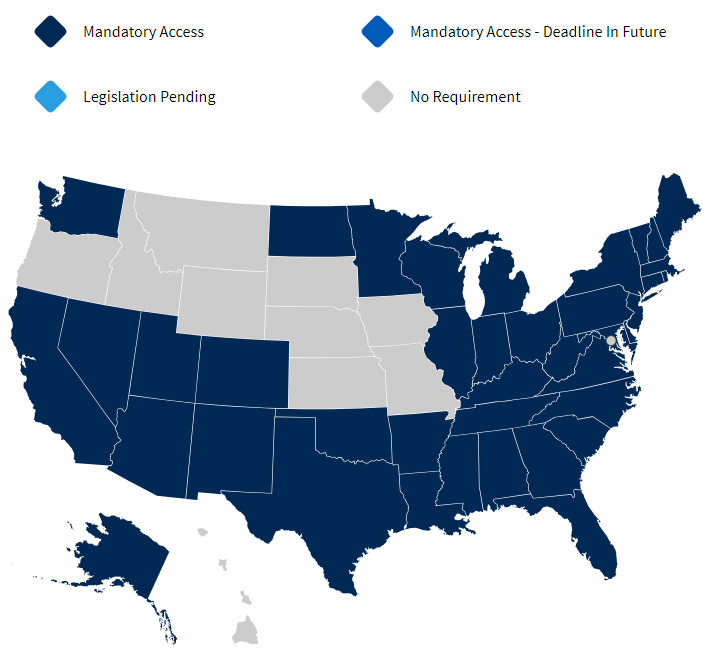 Not all states have PDMP requirements. Those who currently require health care personnel to utilize this system are Arizona, Connecticut, Maine, Minnesota, New York, Virginia, North Carolina, and Rhode Island. These states are seeing drastically reduced incidences of fraudulent patient behavior. This is especially true in highly populated states such as New York, where improved visibility into prescribing patterns and potential drug-seeking behaviors has been critical to combating the practice of “doctor shopping,” as described above, in which drug addicts and system abusers go from clinic to clinic amassing a pile of prescriptions for the desired controlled substances. Looking toward the future, 12 states have requirements pending, and the hope is that the 29 states plus DC and Guam who currently have no requirement will decide to follow suit soon. New York’s successful program has expanded to include access to other state databases and information, and this transparency and interoperability might be a prediction of the future of PDMP. Data regarding PDMP use by state clearly shows positive benefits in the states that use these tools. While research into PDMP effectiveness is ongoing, a 2012 study looked at rates of painkiller abuse and misuse in PDMP vs. non-PDMP states from 2003 to 2009 and discovered that in non-PDMP states, rates of abuse and misuse increased more rapidly than in states with such programs. But PDMPs are not just concerned with legality. Hand-in-hand with reduced fraudulent and abusive behavior is the improvement of identification of and treatment options for those spiraling in the tornado of the addiction epidemic, perhaps the real crowning achievement of these programs. A hallmark of addiction is a lack of self-awareness and honesty regarding one’s own harmful behaviors, and the PDMP becomes a life-saving tool in which doctors and patients can have the transparent conversations needed to kick-start recovery. DrFirst has been at the forefront of electronic prescribing of controlled substances (EPCS) since it sent the nation’s first electronic prescription of a controlled substance. In our partnership with DrFirst, ChartLogic is poised to make a huge impact on this current health crisis as part of a joint effort. The marriage of our software with DrFirst’s program makes sense given the proven success of our ambulatory EHR suite that includes Electronic Medical Records, Practice Management, and Billing Services. And we are proud to be part of a solution that is not only changing lives, but also saving them. Learn more about our PDMP solution here.